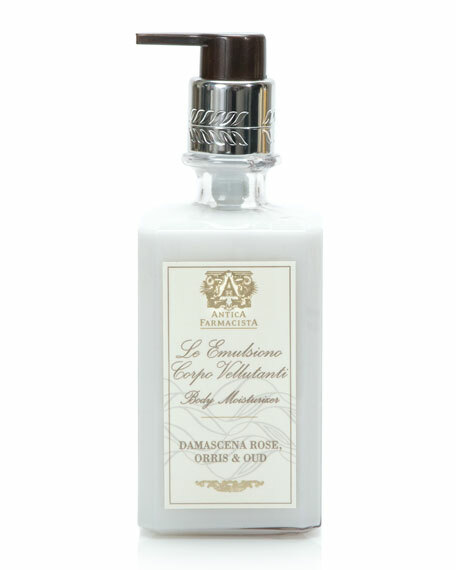 Antica Farmacista Damascena Rose, Orris & Oud Body Moisturizer, 10 oz. Antica FarmacistaDamascena Rose, Orris & Oud Body Moisturizer, 10 oz. An incredibly luxurious formula, providing superior, long-lasting hydration for even the driest skin. It includes natural moisturizing ingredients such as aloe vera, apricot kernel oil, green tea and fruit extracts, sweet almond oil, silk amino acids and proteins, shea butter and honey. Its soft texture is flawless and leaves skin radiant. Damascena Rose, Orris & Oud is an exquisite floral fragrance built on fresh Damascus Rose absolute, sensual Violet and rich Tuscan Orris root. Tart rhubarb and dewy apricot add a hint of lush fruit, while the warmth of rare Oud and Amber lend an exotic earthiness. A soft dry down of musk and cashmere result in an intoxicating and complex floral scent. 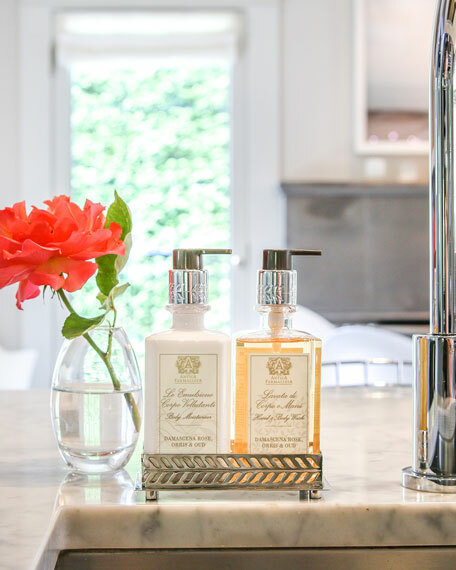 In 2003, co-founders Shelley Callaghan and Susanne Pruitt launched Antica Farmacista, helping introduce the Italian concept of reed diffusers to the U.S. Today, Antica Farmacista has expanded its signature fragrance line to include room sprays, perfumes, moisturizers, and bath and shower washes, all of which are made in America using high-quality ingredients and natural essential oils. Darphin Rose Aromatic Care, 0.51 oz.